I am a person who loves trying different face masks, they are very refreshing. More importantly my face feels soft and looks hydrated. Valentia products are natural and this is something that has become very important to me, when searching for skin products. 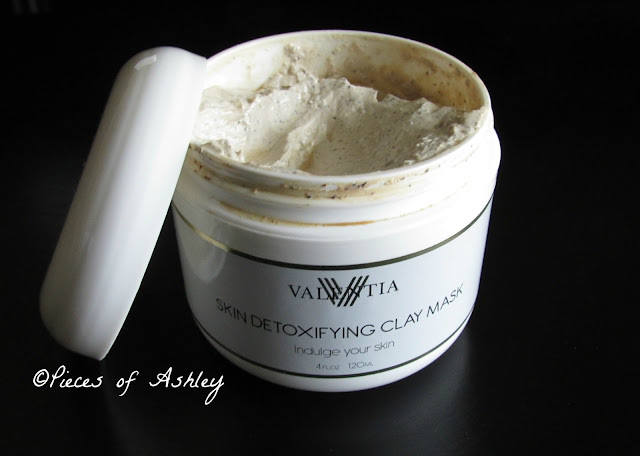 This skin detoxifying clay mask is a, natural kaolin and botanical based mask that gently removes excess dirt and oil. At the same time it deeply cleanses and exfoliates the skin, to reveal softer/ smoother skin. It draws out impurities to improve skin tone. 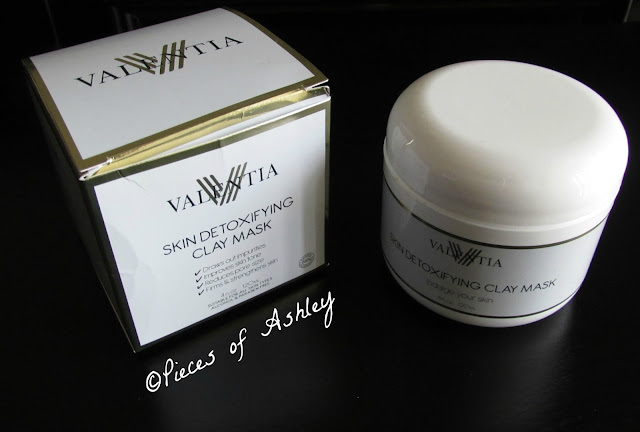 Most importantly, the clay mask reduces pore size while firming/ strengthening the skin. Like other Valentia products, these are suitable for all skin types and its alcohol/ paraben free! Here's the key ingredients in this clay mask and an explanation of what they mean. Responsible for cell production in the human body. This lessens the appearance of wrinkles by, reducing free radical damage and stimulating healthy collagen production. Both of these ingredients lend their anti aging properties to firm and reinforce the skin. This helps to reduce the creation of more wrinkles. A powerful antioxidant that repairs collagen production. This combats free radical damage and restores the skin to elastic, bright, and wrinkle free tones and textures. Known for its detoxifying powers, the clay minerals draw out impurities. Because of this your skin tone is even and the pores tighten for firm skin. The French developed constituent naturally decreases the level of pro aging toxins. This works to soothe the skin, reduce redness, and improve evenness. A botanical stimulant full of vitamins and minerals that hydrates the skins surface, to contribute tissue regeneration of the skin. The clay is like a tan color and there is black specs in there as well. The clay is very smooth and it's very easy to apply. One thing I really love about the directions is that it tells you how you should take the mask off. This is a good way to show the product is beneficial and that it is actually working! When the mask dried I will admit that I was a little nervous. I honestly didn't think it would come off easy. I was wrong though, it was really easy. When I first apply the clay mask on my face, I get a tingling feeling. But as time passes it goes away and I do not feel it anymore. In my opinion I believe that when its first applied it starts to activate. Then while the mask dries it's very soothing. Because this need to stay on the face for 15 to 20 minutes, I have to set out sometime out of the day. Like getting up an extra 15 to 20 minutes early. I love using this product and it's by far my favorite from Valentia. I have only used it for a little white but, so far it has made a difference for me and my face. My skin feels smoother and I do not experience a lot of redness on my face!